It came from the far away reaches of your XBOX One game catalog. Time to go back to one of the first shmups in the XBOX One's library, and this time is the game We Are Doomed. This Twin-stick shooting game offers you two options: The Waves Mode and the Endless Mode. Waves Mode is your "Main Game", here you have to survive 30 levels of enemy waves, while the Endless Mode is the "How long could you survive?" mode. Once you're "Pitted in against the galax...er, geometry's fiercest foe", you only have one weapon: Your "Beam" which unlike its name says it's not a traditional Laser, instead is a medium ranged lightsaber. So, you'll expect to cut anything that moves, but actually they'll take a few seconds to go down, even the very first enemies, so this sword-like weapon behaves like a beam weapon. However there is a special weapon that comes in handy and is the Superbeam, which is an oversized and over-powered form of the Beam, this "Bomb" weapon cuts through everything in a considerable period of time, it even destroys things that the normal Beam can't like the blue "boulders" that you'll normally have to avoid. But the Superbeam is also the key of score-multiplying in this game, just like the Aryustailm's "Sword" Charge Shot did in Blazing Star. However the Superbeam has its own flaws. The first one is if you get hit while firing the Superbeam, you'll lose ALL the accumulated energy rather than keep the unused for a faster-recharge. Second, you can only have 1 Superbeam, making its use more tactical and more of a desperate key of survival rather than a high score-maker, and the worst of all, as a Gauge/Time-based weapon, the weapon still consumes the gauge even if you're not using it, so any plans of a "Controlled Blast" are out. 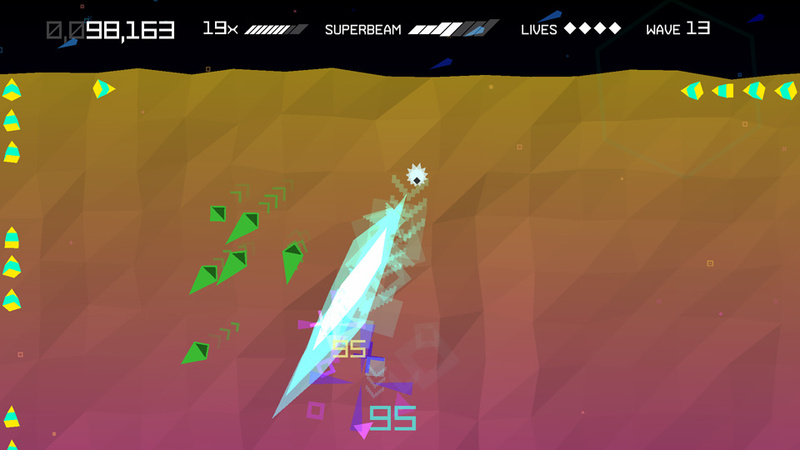 To recharge the Superbeam, you have to pick Multipliers, this items aren't just a Superbeam recharger, they're the score multiplier for this game, as they increase the score value of your enemies, not just for the regular beam but also for the Superbeam, for example, if your score multiplier is of "x16", the Superbeam will have a "x32". Polygonal Mahyem. Geometry is out of control and you've gotta stop it. 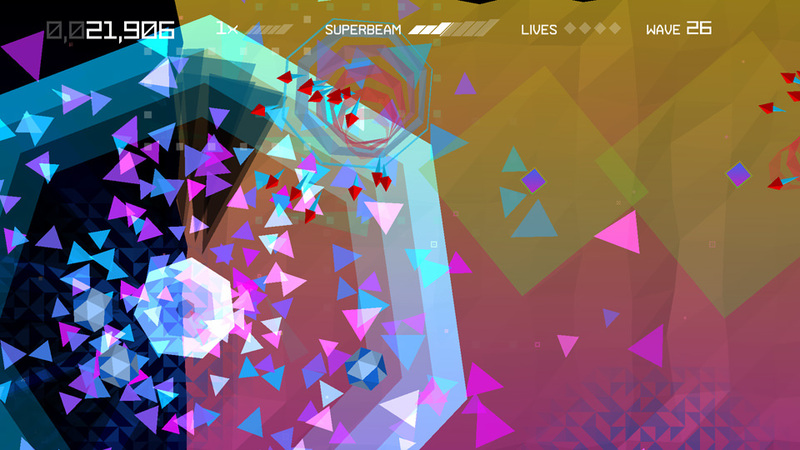 In both modes, the gameplay is the Arena-type shooter in the style of Robotron 2084 and Geometry Wars 3 Dimensions, where the enemies can be troublesome as they take some damage before going down, even at the first stages, also there's the enemies that make random patterns like a "race track" that you should learn its path to avoid unwanted collisions, all that random stuff is similar to the Power Play feature of Zanac A.I. which made every new game session different from the last one. In We Are Doomed it's pretty much the same basis. One of the worst enemies of this game are the "multiplicate-after-dying" type which spits in two after killing one, and this type of enemy appears in groups of around 8 or 10, so this could mean trouble specially if you don't have the Superbeam. There's also the "I aim on your position" type of enemy that once it aims, it fires a fireball on a trajectory based on your final position, it can be avoided, but in the later stages it can be a nightmare of evasive maneuvering which could eventually result in getting hit with something. Everytime you get hit you will lose half of your multiplier score. Like in Triggerheart Exelica where the Item Bonus drop after getting hit and resets after dying and continung the game, in We Are Doomed, your "x16" value could drop to "x8" in a single hit, and to make things worse, the Multipliers won't last forever, so you'll be facing moments of let the item disappear and lose it or take the risk of getting hit again or be killed for picking it. Dying in this game will result in Game Over and starting all the way back from the beginning regardless of which mode you were playing. However in Waves Mode, you can get two available checkpoints by reaching Stages 11 and 21, which can be selected as starting levels, increasing your chances of making it through the game and stay 'til the end. 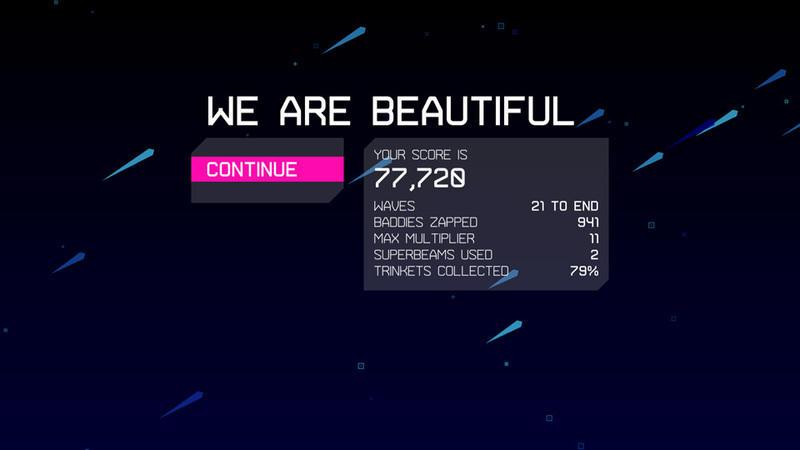 Fortunately, you count with four lives before going down, so the objective of surviving in Waves Mode is more tolerable, but it goes all the way down to hell in Endless Mode as you only have 3 lives in this mode. KRA-BANG! !, Gone in an heptagonal blast! Graphically, there's not too much to talk about just like in Polychromatic's case. As the character designs are a mixture of Abstract Art and Minimalism, as our ship is a 12-point star with a black square as its core. 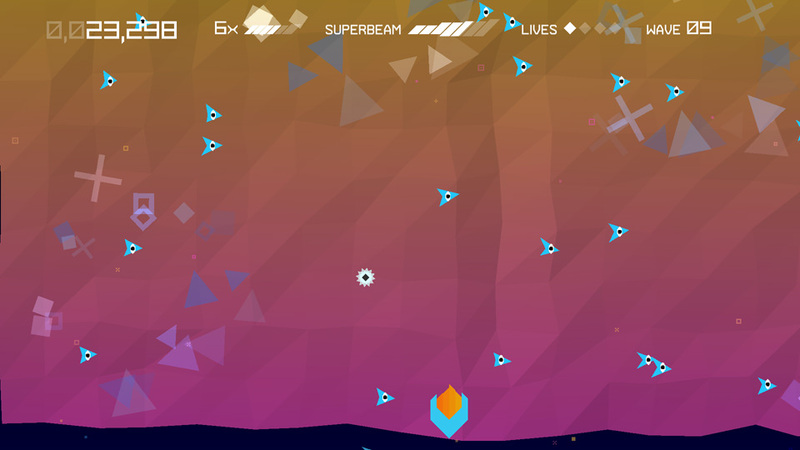 In this "Vectorial-like Battlefield" you'll be pitted against all kinds of geometric weirdoes such as green drops, blue arrows with eyes, purple squares, multicolored cones and red triangles along with larger things like boulders or spheres made with triangles and random shapes that "pulse" as they move in a vibrant color-envolved battlefield. One of the best effects of the game is random things that burst out of your ship while swinging the beam. Even dying is a blasting display of geometry as you burst out in heptagonal shockwaves and colored triangles. But to be honest, it feels more like a game made with the Super FX chip of the SNES era than an XBOX One game (¿remember Starfox and Vortex?). As for the Sound department, is just like the graphics, not too much to talk about. There's a slow eletronic techno pace that would fit well in the styles of Robert Miles and Jean-Michel Jarre (the "Oxygen" album to be more exact). Unfortunately the game only has 1 theme and that's all. There's only one voice sample, a robotic voice that says "Superbeam Ready" everytime the Superbeam gauge is full. And that's all what We Are Doomed has to offer to us. Another "Minimalist Shoot Out" that would only work to exploit some "Gamerscore" points in a few sessions only to be forgotten by better games such as Raiden V, Battle Garrega Rev.2016 and Sine Mora EX. It would only be worthy for those who want a large shmup collection on their consoles. Otherwise, better skip it.